Speech delivered to the senior class in Divinity College, Cambridge, Sunday evening, July 15, 1838. The "Divinity School Address" was delivered by Emerson to the graduating class of Harvard Divinity School in Cambridge, Massachusetts on July 15, 1838. At the time, the Harvard community was strongly Unitarian, and Emerson's argument for a more transcendental view of God and faith was seen as radical, and touched off a great controversy. Prompted by his life experience, Emerson questioned the miracles of Jesus, argued for moral intuition over religious doctrine, and discussed the failures of historical Christianity. Although Harvard and the Unitarian church rejected his assertions, Emerson is viewed as a leader of the Transcendental movement and his other literary contributions have had a notable impact on American thought. 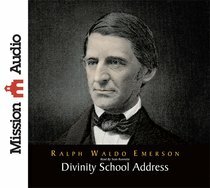 About "Divinity School Address (Unabridged, 1 Cd)"
Known primarily as the leader of the philosophical movement transcendentalism, which stresses the ties of humans to nature, Ralph Waldo Emerson, American poet and essayist, was born in Boston in 1803. From a long line of religious leaders, Emerson became the minister of the Second Church (Unitarian) in 1829. He left the church in 1832 because of profound differences in interpretation and doubts about church doctrine. He visited England and met with British writers and philosophers. It was during this first excursion abroad that Emerson formulated his ideas for Self-Reliance. He returned to the United States in 1833 and settled in Concord, Massachusetts. He began lecturing in Boston. His first book, Nature (1836), published anonymously, detailed his belief and has come to be regarded as his most significant original work on the essence of his philosophy of transcendentalism. The first volume of Essays (1841) contained some of Emerson's most popular works, including the renowned Self-Reliance. Emerson befriended and influenced a number of American authors including Henry David Thoreau. It was Emerson's practice of keeping a journal that inspired Thoreau to do the same and set the stage for Thoreau's experiences at Walden Pond. Emerson married twice (his first wife Ellen died in 1831 of tuberculosis) and had four children (two boys and two girls) with his second wife, Lydia. His first born, Waldo, died at age six. Emerson died in Concord on April 27, 1882 at the age of 78 and is buried in Sleepy Hollow.